What could you find in intu Watford’s big £1,000 festive treasure hunt? For two weeks from Monday 10 December, intu Watford’s very own Mrs Claus – in the form of present-hiding general manager Vicki Costello – will hide a prize in a secret location in or around the shopping centre each day (Monday to Friday) until Friday 21 December. Then it’s down to eagle-eyed members of the public to spot them and bag their prize in time for Christmas! From fashion and tech, to beauty and food, the prizes have been hand-picked to surprise and delight the lucky person who discovers them. Amongst the prizes are an M&S Food Hamper, a beauty bundle from Debenhams, Lush goodies and even an intu Gift Card worth £100. 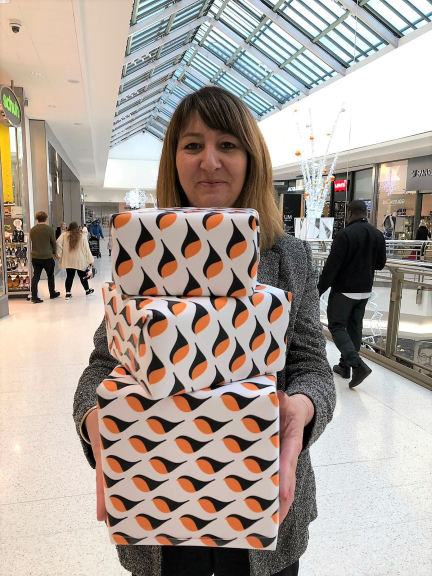 Each will come packaged in an eye-catching intu festive paper, so keep your eyes peeled for the goodies in intu Watford’s tremendous treasure hunt. To be in with a better chance of winning, keep your beady eyes on intu Watford’s social pages where clues as to their whereabouts will be posted daily. If you – or one of your ‘mince spies’ spots a present, pick it up and head straight to intu Watford’s customer information desk where you can redeem your prize. The treasure hunt is just one part of a packed calendar of exciting yuletide activities at intu Watford, where Christmas 2018 is set to be a festive bonanza! The glittering winter wonderland, lit up by thousands of sparkling lights, will be home to all sorts of fun and joy. Think goodies, decorations, shops and restaurants galore, not to mention Santa’s grotto and the new IMAX Cineworld cinema and Hollywood Bowl, opening soon. You really can eat, drink and be merry at intu Watford!